Buy and register a Gypsy by Cricut by October 31 and receive 6 free cartridges downloaded to your Gypsy – including the exclusive, all-new "Smiley Cards" cartridge (and don't forget about Gypsy Wanderings and Gypsy font cartridges that come pre-loaded on the machine). It's a $419 value! New Gypsy cartridge downloads are easy! Just connect your Gypsy to your computer and you'll automatically be prompted how to start. In just a few steps, you'll be able to download all six cartridges containing thousands of images! 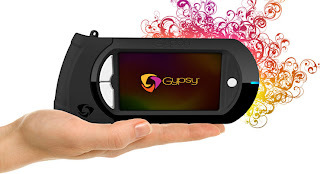 And with Gypsy, you'll have all the cartridge artwork and keypad overlays on your Gypsy screen, so there's no actual cartridge, handbook, or packaging. You only have a few weeks. Don't miss out! !